Blogger and photographer David Scott Allen from Cocoa and Lavender is back on the podcast to discuss a guest article I wrote in collaboration with Diana Zahuranec and other bloggers on “The Basic Rules of Italian Food.” For instance, among the various topics, we talk about the fact that no Italian would dare to cut spaghetti with a knife, to have a cappuccino after a meal, or to cook pasta other than in plenty of salted water at a full boil. You can follow David Scott Allen also on Instagram, Facebook, and Pinterest. The music in the episode is by www.purple-planet.com. 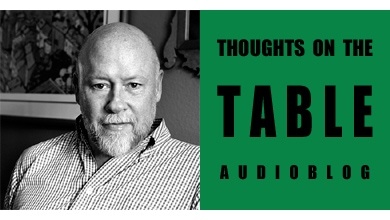 This podcast was FANTASTICO! I rarely hear conversations where I am nodding my head in agreement the ENTIRE time! So many points that I totally agree with, and David, I am a Perugina girl! Just came back from Italy with more, but also bought their chocolate chips to try this time! I also just finished having taralli and Marsala all’Uovo as my breakfast! haha! Great podcast, Paolo! Thanks Christina! Taralli & Marsala sounds like my kind of breakfast too! 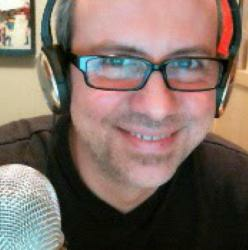 A great podcast with my favourite foodie blogger David Scott Allen. 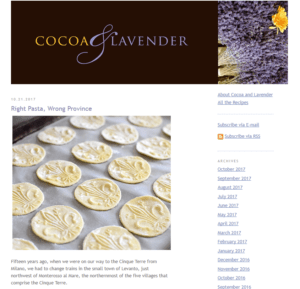 We look forward to his Cocoa & Lavender posts every week. Thanks Carolyne! I’m glad you enjoyed the podcast. Yes – David is a remarkable foodie and blogger! Great interview, Paolo and David! Don’t have any comments since, like Christina, I agreed with every word. I was interested in David’s point about going easy on the eggs in corzetti so they don’t swell too much and obscure the pattern. It’s attention to little details like that that make the difference between merely good cooking and *great* cooking. Thanks Frank! Totally agree on the attention to details. however, may I slightly disagree on few points, as an Italian native and Italian cook. pasta does not need to be cooked in lots of boiling water: u can cook it perfectly with no issues at all also in little water, especially small pasta. Water does even need to be boiling. I pour my pasta in some (not much) boiling water, I switch the heat off, I cover and… after the usual 10-12 minutes pasta is perfectly done. Honest: it works. (I even recall some Harold McGee’s experiment on this). pizza: I eat it with fork and knife and with my hands too and I have seen very many people doing the same : you can cut a slice and then u can pick it up with your hands. It is really up to u, no fast and furious rules. Garlic toast: …. if u mean garlic and butter on toast, you are right we do not have it, nut garlic on toast: we do have it: basic bruschetta. Hi Stefano, nice to meet you! Thanks for listening and for your feedback. Just in general, when we talk about “rules” we don’t mean to be taken too seriously: not all Italians follow them and there are always exceptions. I think that the points we make in the episode, however, do characterize Italian cooking with respect to what is often known as “Italian Food” especially in North America. I’ll respond to your points. On cooking pasta, I am loving the debate, but I respectfully disagree with you. Even though you can even cook pasta as if it was risotto in very little water (and some like it even better) cooking in plenty of water ensures that the starches released during the cooking process are sufficiently diluted to prevent sticking and allow the pasta to cook evenly. (McGee, On Food and Cooking, pg. 576, seems to agree.) A full boil also stirs the pasta as it cooks and it also ensures maintaining 100 degrees centigrades which in my experience is necessary for best results. As for fish and cheese, we’re in complete agreement. And so are we about pizza – you’re right, we should have specified that eating it with fork and knife is not a rule at all, but arguably it’s more common than not in pizzerie, I think. Personally, I cut big slices, eat the softest part with fork and knife, and as I get closer to the crust, I just grab it with my hands! Yeah, that’s what we mean by garlic toast… The pasta accompaniment made by spreading monster amounts of garlic butter on bread, which is then toasted – you won’t see that in Italy for sure. You’re right that garlic does go on bread in Bruschetta, but it’s normally just a hint of it, even just added by rubbing a garlic clove onto the toasted bread. On cocoa I am no expert either, I’m sure it’s largely a personal preference. Interesting studies! Thanks for the links, I’m a big fan of Harold McGee. My personal brief comment is that while the starch in the pasta water is great to thicken the sauce, cooking in little water requires more stirring, it’s a lot more work for me given that normally when I boil the pasta I’m still working on the sauce 🙂 And I would still want to cook in water at a full boil because I can then rely on the fact that the timing is always going to be the same: since the water maintains 100 C, I can simply set the timer to what’s written on the box. Of course, these studies are correct that less water = less energy. If I might jump in and add a personal experience: I’ve tried the Harold McGee method with a long pasta. It was not a very successful experience. The pasta stuck together and cooked very unevenly. On the other hand, I’ve had good results with short pasta cooked that way, but as Paolo says, it requires more stirring than the traditional method to avoid sticking so while you do save some time, it’s more effort. For myself, I do cook pasta in less water than is often recommended, but haven’t gone “full McGee”. On the pizza, the advice not to expect your pizza to be pre-cut for you is sound for the “average” North American. But more and more in this area, anyway, we are seeing pizzerie serving whole individual pizzas in the Italian manner. And, again, from a North American perspective, garlic bread is something very specific—and let me tell you, it ain’t bruschetta. Foul stuff!